In an attempt to bring some order to the chaos that is my sewing room, I uncovered some unfinished projects. Don’t pretend that you don’t have some as well! 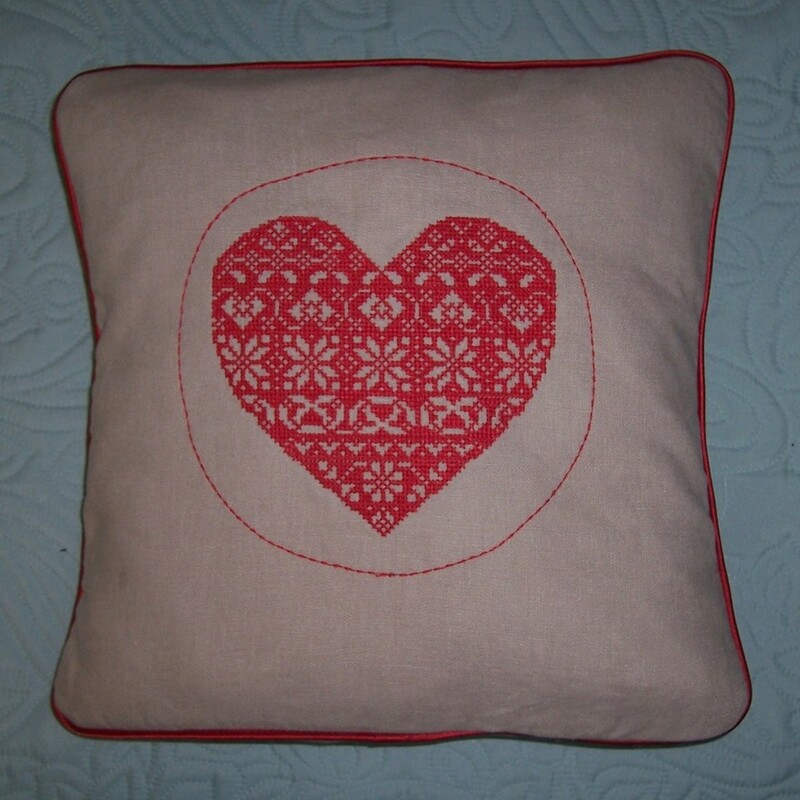 This Cross Stitch Fairisle Heart embroidery was worked last year just prior to Christmas. Unfortunately somehow or other it acquired a very small stain on the lower left hand corner. I applied Vanish stain remover and put the embroidery through the wash. The stain was not so noticeable but still there, disappointment reigned as the stain had not come out completely. The embroidery was therefore consigned to the “roundtuit” pile. However, I really don’t like unfinished projects hanging around so decided to finish it and if necessary donate to a local charity shop. The embroidery had been “filed” in the box together with some more linen for the reverse so I set to and finished the job! I applied some Dark Red satin piping and made an envelope closure for the reverse. As I had no spare cushion pad, I used some plain curtain lining from my stash and some polyester toy stuffing to make the pad. To finish off, I inserted a sachet of Christmas scented granules into the back. 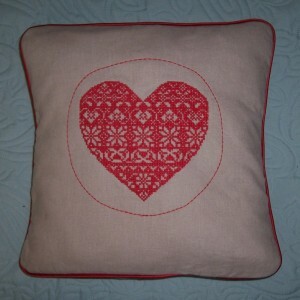 Now the cushion does not look half-bad and has been placed on an easy chair in the lounge. That’s one unfinished project cleared – now onto the next…. Last week at Franklin’s Patchwork & Quilting class, Emma introduced us to “Chicken Scratchings”. 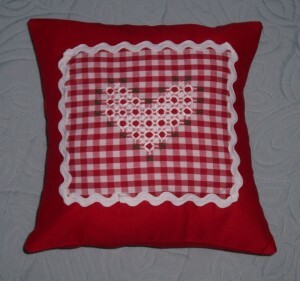 This is a form of hand embroidery worked over gingham fabric. We were provided with all that was needed to make some chicken scratchings of our own – patterns, fabric, thread and needle. As many of you are aware, I don’t “do” hand stitching let alone embroidery, but I thoroughly enjoyed stitching and weaving this design. When I got home I wondered what to do with my sample stitchery. 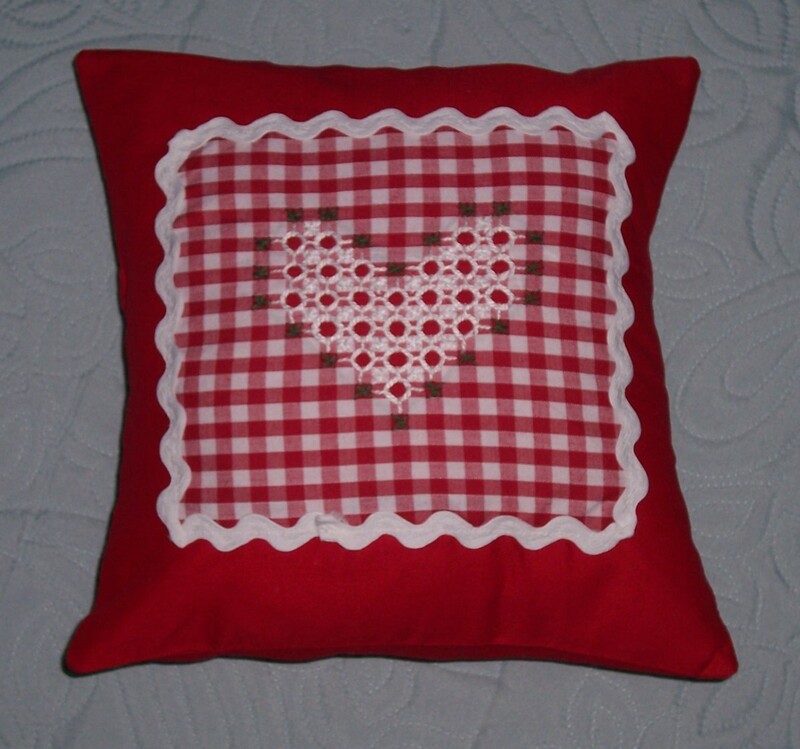 Having pressed well and fused some interfacing to the reverse, I placed the “squared” piece of work onto some plain Red cotton fabric, outlined with Jumbo White ric-rac trim and completed a small cushion. The reverse is also in Red fabric and has an envelope closure. As I still had some scented sachets, I inserted one into the reverse of the cushion which adds to its charm. The completed cushion measures approximately 9.5 inches and now sits perfectly displayed on our bed.